Airfields, roads, dams, and buildings can't be created without moving tons of earth and building materials or producing concrete and asphalt. Many Army missions depend on safe roads and structures for successful missions, and not everywhere the military goes has the necessary infrastructure. So soldiers are often tasked with building it. Heavy construction equipment operators are integral to that process. Military occupational specialty (MOS) 21E, heavy construction equipment operator, uses bulldozers, cranes, graders, and other heavy equipment to complete these kinds of projects. 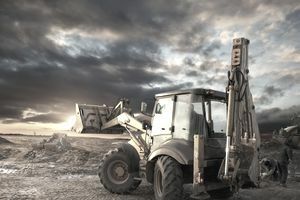 Construction equipment operators are responsible for operating crawler and wheeled tractors with dozer attachments, scoop loaders, backhoe loaders, hydraulic excavators, motorized graders, and towed or self-propelled scrapers. Much like a civilian construction worker, Army construction workers have a wide variety of tasks on a given job site. One day this soldier might be interpreting information on grade stakes. The next day he could be clearing, excavating backfilling, or stockpiling with a tractor crawler or a loader. At some point, MOS 21E will cut and spread fill material with a scraper, scarify and level soil with a grader, or transport the heavy construction equipment with a tractor-trailer. In addition to and in conjunction with these duties, MOS 21E will assist in the performance of combat engineer missions. But it’s not all about wrecking things or spreading dirt; soldiers in this MOS do a fair amount of construction as well. They may construct beams, excavate hills, grade soil, finish slopes, construct berms, and perform surface and drainage maintenance. In order to serve as a Heavy Construction Equipment Operator, soldiers will need to score at least a 90 in the General Mechanical (GM) area of the Armed Services Vocational Aptitude Battery (ASVAB) test. No security clearance is required, but those who want to serve in MOS 21E must have normal color vision (no colorblindness) and a valid state motor vehicle license. Following basic training, soldiers for this job train anywhere from four to 12 weeks at Fort Leonard Wood in Missouri, learning all the various equipment and proper procedures for using it. Most Heavy Construction Equipment Operators will specialize in one of the above areas, which will determine how long their training lasts. It also determines where you may be deployed; MOS 21E could go literally anywhere the Army has a project in need of construction or excavation. You're almost certain to travel the world in this job, and could be assigned to command immediately following heavy equipment training. This job might not be the most high-profile or glamorous in the Army, but it's one that leaves soldiers best-equipped for post-military employment. Since you'll learn how to use many different pieces of heavy construction equipment, you'll qualify to work on construction sites and with landscaping or excavation companies. What Does a Radio Operator-Maintainer Do? What Does a 68D - Operating Room Specialist Do? What Do 91C–Utilities Equipment Repairers Do? What Is a 68J - Medical Logistics Specialist? What Do AH-64 Attack Helicopter Repairers Do?